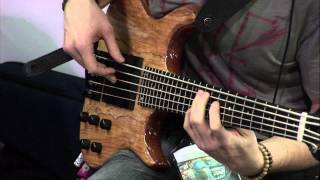 PreSonus—Live from NAMM 2013: Victor Wooten, Steve Bailey, and David "Fingers" Haynes, 3 of 4. PreSonus—Live from NAMM 2013: Victor Wooten, Steve Bailey, and David "Fingers" Haynes, 2 of 4. PreSonus—Live from NAMM 2013: Victor Wooten, Steve Bailey, and David "Fingers" Haynes, 1 of 4. PreSonus—L'Angelus at NAMM 2013: "Ça C'est Bon"
PreSonus—L'Angelus at NAMM 2013: "Cajun Twist" and "Take On Me"
PreSonus—L'Angelus at NAMM 2013: "I Like That Song"
PreSonus—L'Angelus at NAMM 2013: "I Love That Man"
PreSonus—L'Angelus at NAMM 2013: "It's You I Love"
PreSonus—L'Angelus at NAMM 2013: "La French Song"